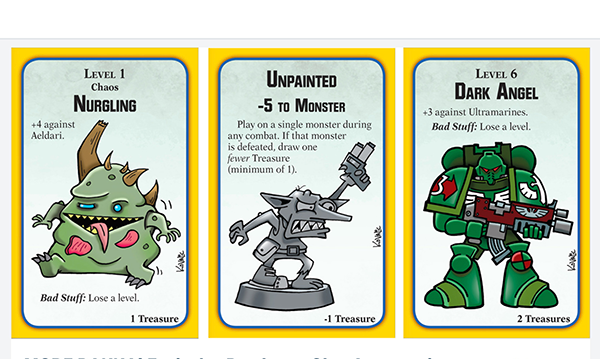 Daily Illuminator: Munchkin Warhammer 40,000 Previews On John Kovalic's Patreon! September 8, 2018: Munchkin Warhammer 40,000 Previews On John Kovalic's Patreon! In addition to his amazing Munchkin work, John Kovalic has a plethora of quality projects, like Dork Tower (his long-running webcomic for nerds, about nerds). He runs a Patreon to help support, and get fan feedback on, these projects. In addition, he's been known to give fans sneak peeks at content, like some new cards he did for Munchkin Warhammer 40,000, coming in 2019! If you like sneak peeks at art, sketches, and generally fun content, you should consider backing John's Patreon! For the Emperor!